Toddler Approved! 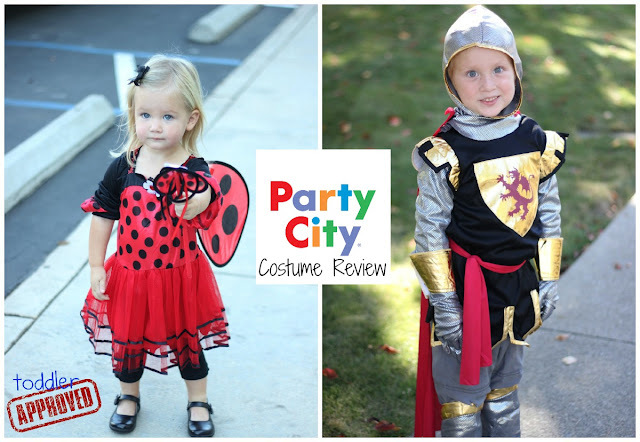 : Party City Costume Review and Toddler Costume Tips! Party City Costume Review and Toddler Costume Tips! This post is sponsored by Party City: Nobody has more Halloween for Less. Party City invited us to try out some of their exclusive costumes and share them with YOU for this Halloween season! I will also be sharing a few of my toddler costume tips below! Have you gotten your costumes for Halloween yet? If not, Party City has loads to choose from! As part of this review we received two Exclusive Party City costumes and we were asked to compare them to some similar mass marketed versions of the same type of costume. The Party City Girls Ballerina Ladybug Costume came with a wand, little headband, a dress with an attached tutu, and wings that attached to the back of the dress using velcro. The costume is long sleeved and the material used is sturdy, soft, and silky. The skirt didn't appear to be itchy, but we wore our own leggings underneath it. The costume ad shows a child wearing tights, but tights are not included in the costume. The sleeves were quite long for my almost two year old and we had to keep rolling them up so she could use her hands, but the dress was a great length and went to her knees. The wand was her favorite object and she loved to wave it around. The headband got worn for only a few seconds because she's not a fan of headbands. The wings were sturdy, large (without being bulky), and stayed in place for the entire Halloween party that we attended. She did not try and remove them. 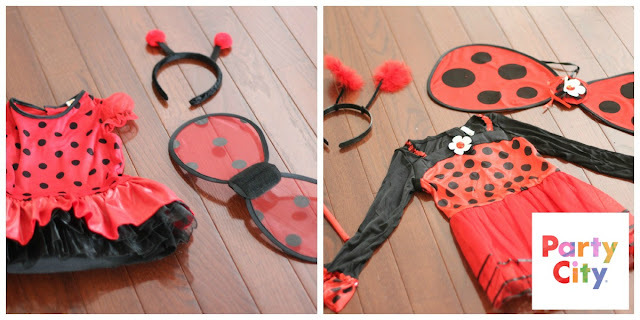 The mass marketed version of the ladybug costume came with a short little dress, wings that attached to the back with velcro, and a little headband with red balls on it. The dress was easy to put on and the perfect size for my toddler as long as she wore leggings or tights. I actually thought she looked adorable in it, but she didn't love the itchiness of the skirt or sleeves. There is elastic around the sleeves that wasn't comfortable. This dress didn't stay attached very well in the back at the neck and the wings were very easy to pull off. They stayed on for only a few minutes as did the headband. Overall, if I were to choose between these costumes I would choose the Girls Ballerina Ladybug Costume from Party City because it appeared to be a higher quality costume and came with more fabric and accessories. I do think that the sleeves need to be much shorter since my daughter is large for her age and they were still too long! The Party City Boys Brave Crusader Costume came with a tunic, hood, cape, gloves, sash, and boot covers. My son thought this costume was very comfortable and he kept it on for quite awhile and loved showing it to his friends. He liked how the cape moved around but also hung inconspicuously so that it didn't bother him too much. He was disappointed that the front of the costume bag showed a sword and shield and the costume actually didn't come with either of those objects. The boot covers were very tight and didn't fit over any of the boots we had at our house, but would work with just regular shoes, though they looked a little weird. My son was also a big fan of the gloves and they fit well. The mass marketed version of the knight costume came with a tunic, hood with crown attached, and boot covers. The boot covers were uncomfortable and didn't work well with any boots we had in our house... or shoes, so we didn't wear them. The hood with crown and the arms of the tunic were made of a netted material that felt like fake chinked armor and was super itchy. We had to wear a long sleeved shirt underneath which made the outfit hot and it was still itchy even with the extra shirt. My son would only wear the hood and tunic for the pictures and then wanted to take them off immediately. Overall if I were to choose between the two costumes, I would pick Party City's Boys Brave Crusader Costume. So, what are your kids wearing for Halloween? Did any of you buy costumes at Party City? What are your costume tips for toddlers? 1. Choose a costume that is comfortable and simple! Toddlers can't be bothered with carrying props, so stick to costumes that have everything included or aren't too complicated. 2. Dress in layers! Your toddler might decide when you arrive at a party that he has no desire to wear his costume any more. Don't be disappointed... be smart! Dress him in layers and make the bottom layer just as cute as the top. I love to buy skeleton pjs or cute Halloween shirts to put on under costumes so that when my kids choose to strip down (because they always do), they still look festive and cute. Disclosure: We received all costumes featured in this post for free from Party City. The opinions shared were not swayed by compensation/free products and are a valid representation of how we feel about the costumes. Your opinion may differ. I like number 2, which takes being smart and flexible. After I spent time making a homemade tutu, that was the part my daughter wanted to ditch. I got a few pictures, then let it go! Excellent post! I like this...Thanks for sharing!